All is set for the LITT 2013 Workshop. 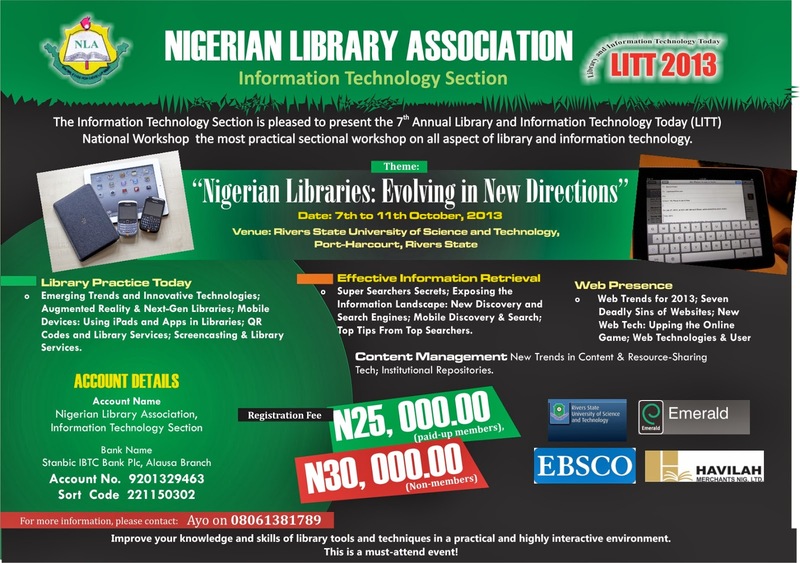 The host institution, Rivers State University of Science and Technology, Port-Harcourt is fully prepared to give us state- of-the-art facilities for hands-on-training that will be anchored by seasoned contemporary librarians. -Registration covers workshop materials, certificate, bag, CD, refreshment and lunch only. Don’t miss it, prepare to attend NOW. CONTACT: Mrs. Akobo, LOC, Chairperson on dataineakobo@yahoo.com || 08036659679 for further enquiry on accommodation and logistics .